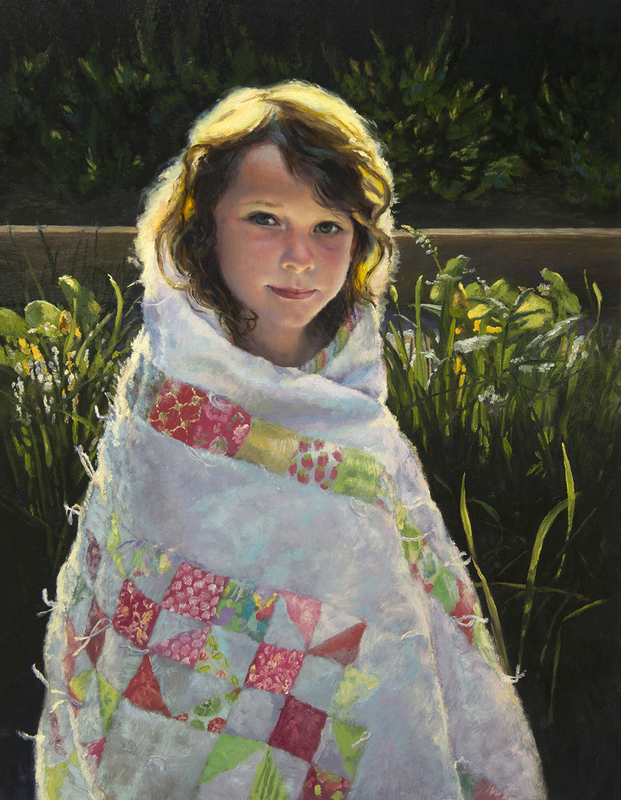 Earlier this year I completed this portrait of my daughter, Naomi, it has all the aspects I love exploring in a painting, a particularly challenging light effect, a use of expressive color, and my beloved daughter wrapped in the first quilt I ever completed. 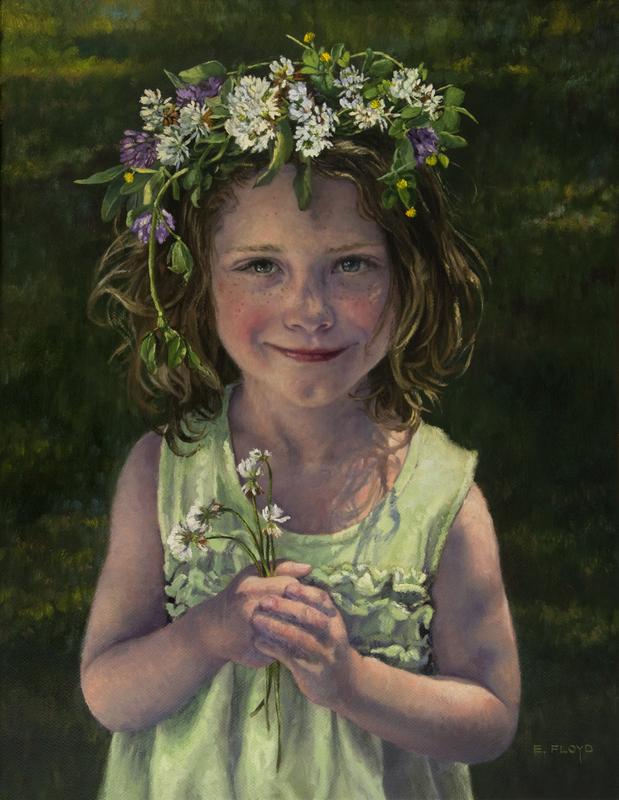 In June this painting graced the cover of the local magazine, Elan. I was honored to have Natalia Megas write an article about my career path and work. And today, as I write this post, I feel fortunate to be an artist and to create on a daily basis. Especially as the person in my life who had a profound influence on the interests I have cultivated as an adult is no longer here. Last week my grandmother passed away, and it is her influence on me as a child that led me to be committed to “making and creating” my way through life. I have been thinking a lot about her since I heard the news that she had died and I keep asking myself to remember the various ways she shaped me. One experience stands out to me the most. It took place when I was nine years old and I was staying with her for an extended visit. When I arrived the only clothes packed were play clothes, nothing nice enough to wear to church. This was unacceptable to Grammer (what the grandkids called her), however she immediately solved the issue by sewing a quick shirt and skirt ensemble for me. I still remember the blue calico pattern of the top, it was one of her fabrics she would use in her quilts. Grammer was a quilting fanatic at the time, and through this experience, I learned that it was possible to make and create your way out of problem or situation. My desire to always have some sort of sewing project going can be directly related to her influence. I will miss my grandmother, however I know every time I sit down to quilt or sew, I will be with her in spirit. This post is more personal than I typically like to publish, however, I am hopeful by sharing these thoughts and feelings I will better be able to metabolize the grief I am currently experiencing and begin creating again. This is a painting of my daughter, Naomi, with her friend, Kiaya. They were two-year-olds when they first met in September 2013, and they have regularly been weekly playmates since then. This double portrait is my personal exploration of their friendship, and a summer-time play date from last June (2016). 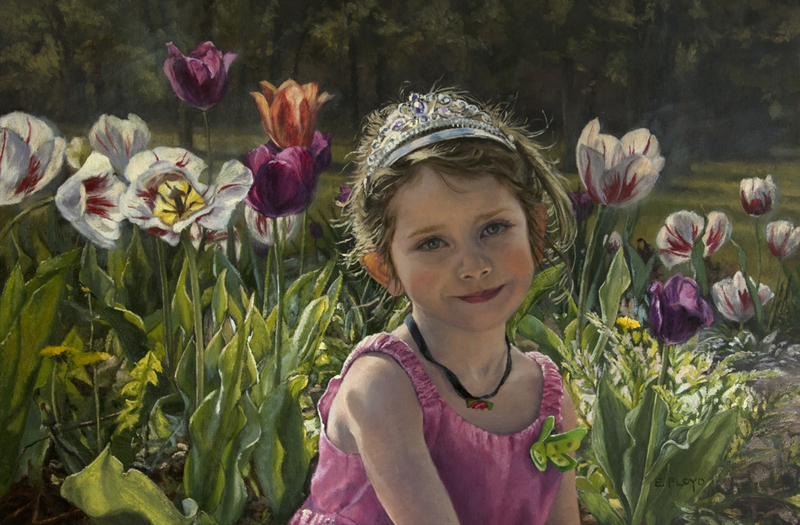 My dear daughter Naomi is a girl who likes to dress up, and tiaras are a favorite accessory. One spring morning this year when the tulips were at their height, Naomi had dressed and primped from preschool and looked so beautiful in the morning sunlight, I had to capture the moment and turn it into a painting. My dear daughter Naomi turned five yesterday. This is how she looks this summer, sun-kissed with freckles, shoulder length hair and a whimsical smile. Hello,This August my work will be part of a three-woman exhibition! (Yay!) I am super excited about this opportunity to have my work hang beside the talented Cindy Procious and Mia Bergeron. In addition to the exhibition, the Principle Gallery is also hosing another FaceOff Portrait Painting demonstration. We three ladies (Cindy, Mia, and I) will paint a portrait sketch in three hours on Saturday, August 27th. In order to prepare for this event, I need your help. 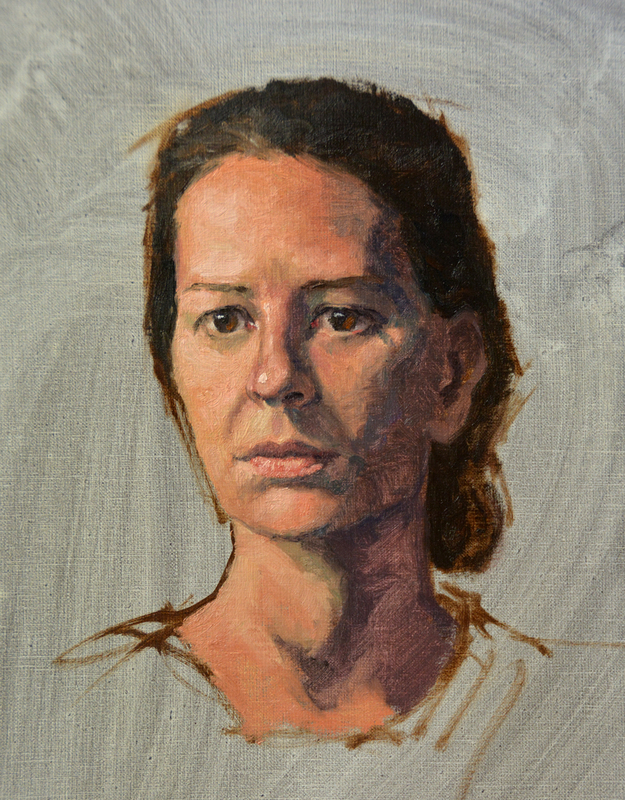 If you live in the DC area, I am looking for people to volunteer for a 2-hour practice portrait sketch. Here is a link to available dates. And this is a recent portrait sketch completed a few weeks ago. Two summers ago I participated in this event, and you can read more about how I prepared for the FaceOff then. Read more here and here.